Checkbox 6.6 Released to Hosted Customers – Checkbox Survey Inc.
Checkbox Survey Online (hosted) customers have been patched to our latest version, Checkbox Survey 6.6. Server customers will receive access to the patch as soon as documentation is complete and should stay tuned to our Announcements forum for more details. Server Enterprise customers can now utilize external server caching for the application. This requires a memcached server or elasticache from Amazon Web Services. Server customers can now utilize Amazon's DynamoDB as a session state store. The majority of the application has received updates to its internal caching system. This should increase performance throughout the application, especially when creating, editing or taking very large surveys. The Question and Description tabs on the survey item editor have been combined into one tab called Question, eliminating unnecessary clicks. The Description tab has been renamed Subtext and has been moved to become a sub-tab of the Question tab. 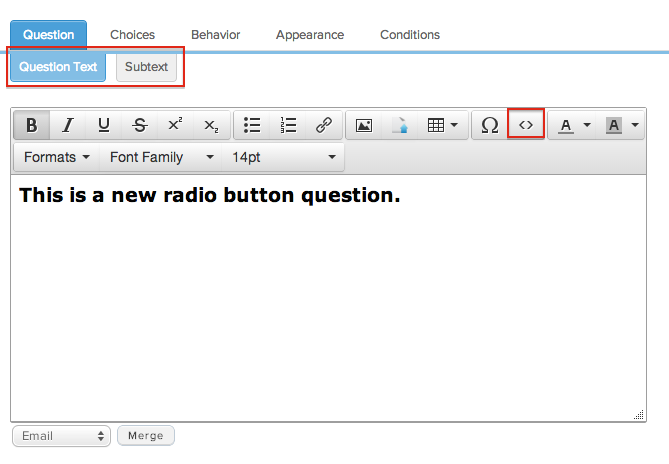 Survey Admins/Editors can edit the Question or Subtext HTML by clicking the <> icon on each respective tab. Combined related question items in order to simplify the survey editing process. Message and HTML items has been combined into one item type - Message/HTML. Surveys with existing Message or HTML items will no be affected. The Horizontal Line and Image items have been removed and incorporated into the Message/HTML item. Horizontal lines and images can be added by using the appropriate icons in the Message/HTML editor. Existing surveys that contain Horizontal Line or Image items will not be affected. The Scoring Message item has been removed. A scoring message can be displayed by adding a Message/HTML item and merging the Current Survey Score response property. 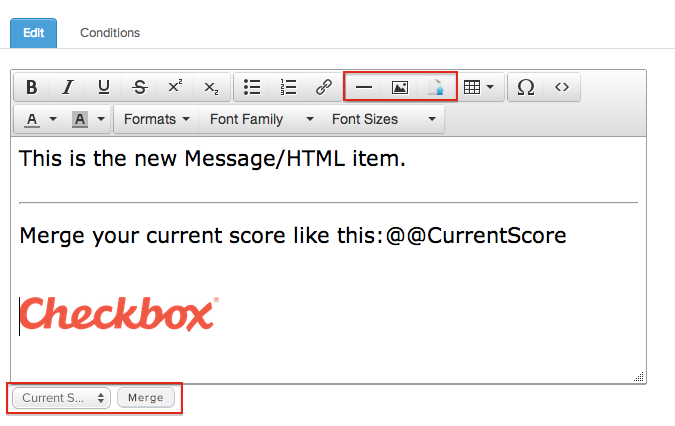 This will allow for easier formatting of a current score message. You should no longer have to scroll down to see the Save button in the Style Editor. Merging a value into the description text of an item should no longer sometimes cause the merge code to appear in the question text. Same-page row conditions on a matrix item should no longer cause the format restrictions on a sum-total column to be ignored. Saving a style in IE-10 should no longer cause the wrong dialog to appear. Editing the header of a style should no longer push the preview below the page. Removed Close Window action item since most modern browsers do not support this type of action.